Scott R. Swain and Michael Allen. Reformed Catholicity: The Promise of Retrieval for Theology and Biblical Interpretation. Grand Rapids, MI: Baker Academic, 2015. 176 pp. $19.99. Is it possible to be both Reformed and catholic? Can one stand squarely within Protestantism and yet be vitally engaged with, say, the early church? Can one be uncompromisingly committed to the Reformation solas while also visibly rooted in the patristic and medieval heritage that preceded the Reformation? For many evangelicals, the answer to these questions is vaguely negative; for a few, the words evangelical and ancient are nearly antonyms. A number have even left evangelicalism altogether in search of a greater sense of catholicity and historical rootedness, looking to Rome or Constantinople for what they felt was lacking in Wheaton College or Rick Warren. 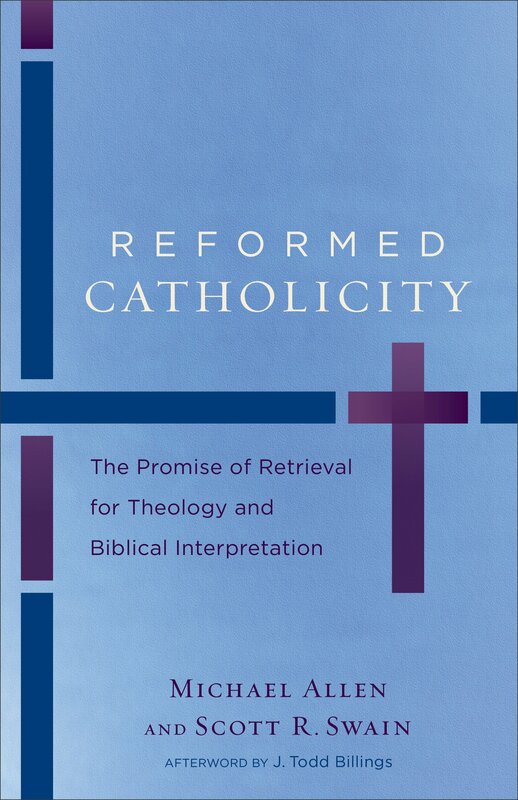 Scott Swain and Michael Allen’s Reformed Catholicity: The Promise of Retrieval for Theology and Biblical Interpretation argues, however, that it isn’t necessary to choose between a Reformation identity and a catholic heritage. Indeed, in their account, “to be reformed means to go deeper into true catholicity, not to move away from catholicity” (4). Moreover, although their work is conversant with a broad array of Protestant and Roman Catholic voices, Swain and Allen ground their case specifically in Protestant and evangelical principles regarding Scripture, the church, and the gospel. Their call for a retrieval of the entire Christian church is therefore not structured as a movement away from the particulars of Reformation theology, but rather as a healthy outgrowth from a mature Reformation theology. For anyone desiring to grow in understanding of the rich moorings of Protestant identity—or for anyone who simply wants to read a model of neat, crunchy theological writing—Reformed Catholicity is a helpful resource. Swain (associate professor of systematic theology and academic dean at Reformed Theological Seminary in Orlando) and Allen (associate professor of systematic and historical theology at RTS) cast their book as a “volley in an ongoing discussion” (12). Observing a number of other signs of progress in the project of Reformed catholicity, they reflect, “[It] was time to step back and speak programmatically about what such projects assume” (vii). They offer their book as a “manifesto” (12) of these various movements, centered on the conviction that “we can and should pursue catholicity on Protestant principles, and that pursuing this path holds promise for theological and spiritual renewal” (13). What specifically is included within the compass of Swain and Allen’s manifesto? In the introduction they isolate 13 examples of similar “renewal through retrieval” projects, ranging in diversity from Karl Barth’s revival of dogmatic theology to the modern hymns movement, from Thomas Oden’s “paleo-orthodoxy” to Radical Orthodoxy. But as the book develops, their most significant conversation partners tend to be people like Kevin Vanhoozer, John Webster, and Herman Bavinck; and the “theological interpretation of Scripture” movement is of particular interest. At the same time, Swain and Allen will occasionally differ from others in the theological interpretation movement; for example, see their balanced engagement with Luke Timothy Johnson, Stephen Fowl, and Sylvia Keesmaat on the Jerusalem Council in Acts 15 (74–78). On the whole, while Reformed Catholicity brings under its banner a number of diverse trends, it also carves out its own space and deserves to be taken on its own terms. Because the book has several distinct parts, some of which are drawn from prior publications, it may be useful to chart out its flow of thought. Chapter 1 argues the catholic church is the context for doing theology, and emphasizes the role of the Holy Spirit as the church’s teacher. Engaging especially with George Lindbeck, Reinhard Hutter, Erik Peterson, Karl Barth, and John Henry Newman, the authors hammer out a vision of Scripture and tradition that is both firmly committed to the sufficiency and finality of holy Scripture while also rising above the “me and my Bible” approach that too often characterizes modern Protestants. Because theology is a specifically pneumatological and ecclesiological task, churchly tradition is “the school of Christ” that cannot be simply ignored by those under the authority of Scripture. An important and recurrent part of their argument lies in their distinction between the principium cognoscendi internum (internal cognitive principle of theology) and the principium elicitivum (elicitive principle of theology), by which Swain and Allen assert that Scripture is sufficient as the source for theology but not as the goal of theology (18, 36). This foundational chapter then leads into chapters 2 and 3, where the authors seek to rehabilitate the Protestant doctrine of sola Scriptura from its “bastardization into a ‘no creed but the Bible’ approach to faith and practice” (49). Swain and Allen combat several recent accounts of sola Scriptura, particularly those of Brad Gregory and A. N. Wilson, as tending towards subjectivism and individualism. They argue that in its original Reformation context, sola Scriptura assumed a catholic framework, pointing to various examples in Reformation confessions, practices, and the writings of Martin Bucer. Chapter 3 extends this discussion of sola Scriptura, arguing that the Bible itself encourages us not to read it in isolation from the entire community of believers (they call this “biblical traditioning”). The import of their discussion is that it’s not the Reformation doctrine of sola Scriptura that stands in tension with creeds and tradition, but only the more recent and more restrictive interpretation of this doctrine sometimes termed solo Scriptura (cf. 85). Chapter 4 offers a distinctively Reformed perspective on how the rule of faith (regula fidei) might function as a hermeneutical guide for interpreting Scripture. In Swain and Allen’s perspective, church tradition and creed does indeed have a kind of hermeneutical authority, but it’s a “subordinate or ministerial authority” that is itself both established by and accountable to Scripture. Chapter 5 then brings these conclusions to bear by mounting a defense of prooftexting, a habit much maligned by some contemporary scholars but one the authors feel has served historically “a wonderful function as a sign of disciplinary symbiosis among theology and exegesis” (117). They consider three particular charges against prooftexting, and point to Thomas Aquinas and John Calvin as examples of a more sophisticated use of prooftexting that rises above these charges. Todd Billings’s afterword supplements the volume’s overall case by showing how Reformed catholicity combats our American tendency toward consumerism and “moralistic therapeutic deism” (as defined by sociologist Christian Smith). Billings argues that a Reformed catholic framework has the resources to ground our identity in traditions of thought and practice that pull us out of our natural and cultural inclinations. This is a lively and provocative section that adds a helpfully practical dimension to the overall thrust of the book. Overall, Allen and Swain’s work is a compelling account of a theological identity that is both Reformed and catholic, both firmly Protestant while also rooted in the entire history of the church. It is an impressive book: thorough in research, broad in reach, penetrating in judgment, cross-disciplinary in implication, and clear and compact in articulation. There are points here or there that may benefit from being refined by further conversation and interaction, and sometimes one wonders whether they make church tradition a bit too immovable and grand. For instance, I stumbled over their discussion of “dogmas” on page 112, although I couldn’t tell whether this was because of their language or because of outright disagreement. But overall Reformed Catholicity is a welcome challenge, especially given the tilt against tradition in much of the evangelical world. This book will be useful for initiating newcomers to the task of theological retrieval, answering criticisms of this project, deepening conversations about how it’s best done, and shaping and guiding those already sympathetic to the effort. Editors' note: Scott Swain will lead a workshop titled “Your Eyes Will Behold the King in His Beauty: Exploring a Missing Element in Earthy Evangelical Eschatology” at The Gospel Coalition 2015 National Conference, April 13 to 15, in Orlando. Register today.